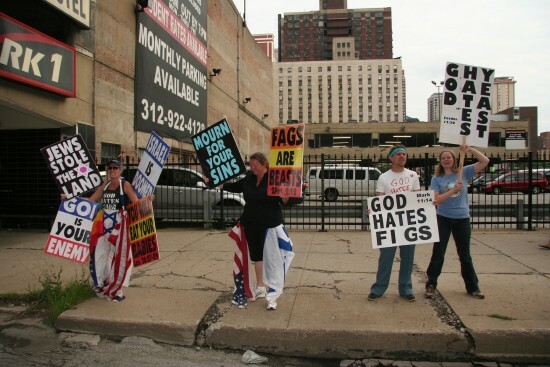 Protester hyperbole: can it be fun? 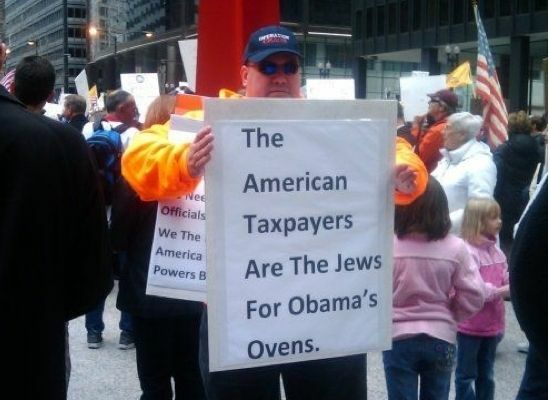 I’m not much of a protester. It’s not that I don’t have passionate feelings about some policies; I do. 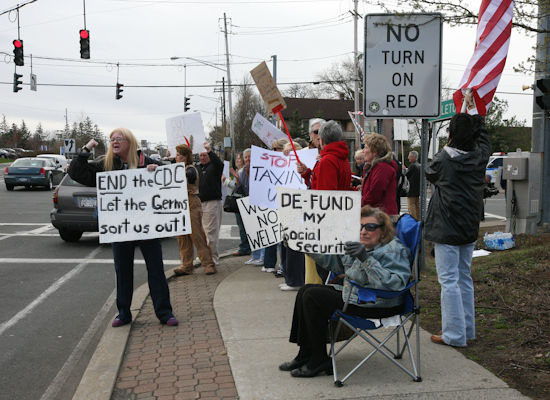 It’s just that I don’t like protesters Left, Right, or Center. Yeah, I may agree with you on points A, B and C; it’s just that I think you’re an irritating person and I hate you. Comic artist Peter Bagge confirms my suspicions in this hilarious comic from reason.com. Unlike Peter, I’m not a Libertarian. I won’t get into politics here, because that’s not why I’m writing today. I’m writing today to encourage those of you with a political passion to make yourselves heard via absurdity. Unlike the fellow above, I’m not interested in folks who are too stupid to realize their opinions are absurd. 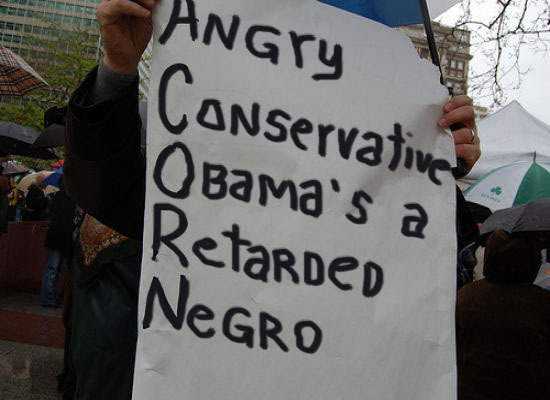 Instead, I think there is a more effective form of protest: monkey-wrenching the entire format. I approve of this, but it's not effective. I have an alternative solution. If you want to submarine the opposition AND get your protest sign on nationwide TV, you’ve got to join the protesters and make your sign a bit too hyperbolic. Since I have a special loathing for the Teabaggers, I’ll use them as a case study, but this concept can be applied to any protest situation. This is the kind of protest movement I can get behind! Why dilly-dally about with FOX News talking points when you can really go for the jugular? Best of all, your covert counter-protest will be welcomed by all in attendance! Hell, you may become spokesman for the mob! And if you play your cards right, you may even become a paid expert for a broadcast “news” organization! Wow! I like what I like. When it comes to music, I get pretty damn picky about it. The music I like thrills me, moves me, transports me. The music I dislike drives me utterly bonkers. I can sit through a crappy film or lousy play. I’ll even finish a book that I find a bit boring. But bad music? I’d kick a speaker to smithereens if I had to. That said, I try to refrain from criticizing the musical tastes of my peer group. I learned long ago that people who vehemently trash a musical act are loathe to declare their love for an alternative choice. It opens them up to criticism from the same punters they just insulted. In today’s post, I want to talk about the music I like and why I like it. We’ll not tarry on music I dislike. 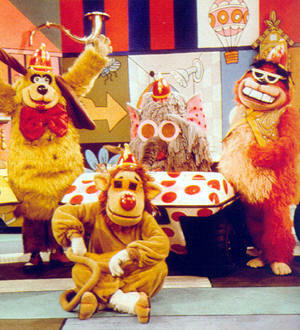 The Banana Splits, shown to the right. Sewn together by Sid and Marty Kroft, the Splits were a shameless, manufactured bit of TV music appropriation. And I loved them. I even got a six-wheeled Banana Splits car by sending in umpteen boxtops of breakfast cereal. Oddly enough, the Banana Splits had a slightly psychedelic twinge to their songs – many of them written by Al Kooper, Barry White and Gene Pitney. At this time (the early 1970’s) I also enjoyed the Monkees, who were a more polished version of the Banana Splits. The Monkees found worldwide acclaim, mostly because they actually played their instruments. When I was 9, my parents bestowed on me a red transistor radio with which I could tune in WABC New York. This meant I had direct access to Elton John, the Bay City Rollers, the Bee Gees and John Denver. By 1975, I discovered the joys of FM radio and everything changed. Not only did I pass through puberty, but music grew up with me. Gone were the pop sounds of AM radio, replaced with the AOR of Bruce Springsteen, The Who, Pink Floyd and Led Zeppelin. In addition to these current acts, AOR radio replayed the Beatles, the Kinks, David Bowie and the Grateful Dead. WNEW-FM was something that modern radio listeners couldn’t imagine: a 24-hour museum of music where the DJ’s actually spun their own beloved music and told tales to hold the narrative together. We would actually tune in to WNEW to hear a specific DJ. Can you imagine? When I was 13, we moved. My new friends introduced me to new things. 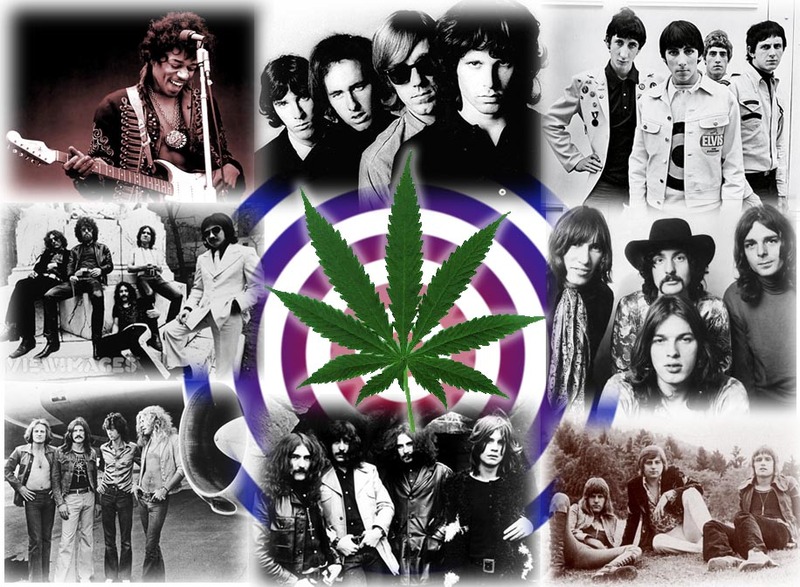 Among them was marijuana and psychedelic music. We would smoke ourselves stupid and blast druggie music at unspeakable volumes. These experiences changed my life. These early experiences with music and drugs created a synesthesia similar to that of Moses on the mount, Jesus in the desert, Ghandi at the spinning wheel or Popeye on a spinach binge. If you’ve never experienced Pink Floyd’s early records with your mind painting pictures of the sounds within and without your head, you just haven’t had a very close affinity with music. I discovered what makes a symphony conductor’s brow knit tightly as he commands a surge of violins. I unraveled the existential ribbons that formed in Mozart’s mind. I flew over rushing ground on wings of soaring guitars. I have not just heard Jimi Hendrix’s guitar, I have seen it express itself as clearly and poignantly as a human voice. Poetry in tone and timbre. With psychedelic music, I was floating downstream on my back while above me the sun strobed between the leaves of a forest canopy. From the shimmering walls of Black Sabbath metal to the dancing, multi-dimensional colored sprites of Pink Floyd were new worlds that only I could see. This was something I had to explore. Becoming an adult, I graduated to a higher level. I still enjoyed all my druggie bands, but I needed to climb the ladder a rung or two. My brother Henry had introduced me to prog rock and by this time I had embraced it all. Early King Crimson fits well into psychedelia, but it offered some things that Pink Floyd lacked: lyrical depth and musical sophistication. I quickly assimilated the entire King Crimson library and committed every movement to memory. Undeterred by the fact that girls had no interest in this music, my insatiable appetite for ever grander psychedelic music experiences found me wallowing in heaps of Genesis, Yes, King Crimson, ELP and Oldfield. Despite the transition to a more symphonic milieu, I was still being moved by a singular aspect of this music: its ability to hypnotize and mesmerize. 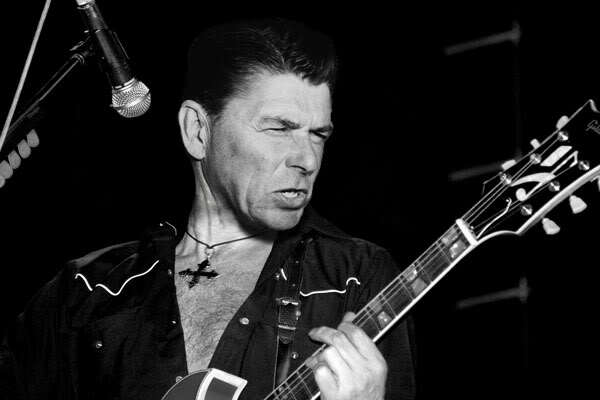 At this point, I had all but jettisoned any interest in “rock n’ roll” and its extreme conclusion, punk rock. Oh, I appreciated punk rock for what it was and what they were doing. I just couldn’t sit still for four sloppy punks ramming their instruments in 4/4 and screaming into a microphone about how stupid society is. It’s kind of like silly performance art: yes, very nice, lovely. NEXT! During the mid-late 1980’s, there was no music worth mentioning. As the 90’s dawned, something important happened. Below the surface of the “grunge” movement, a bold new school of songwriters tossed out the playbook. Standing on the shoulders of giants, they looked back at the devastation wrought by the 1980’s and, from this great perch, saw even farther back. From Bachelor Lounge to Neo-Traditional to “college rock”, this new generation started creating some truly amazing music. From the reborn 60’s retro sounds of Pizzicato 5 and Love Jones to the dark, serious, hypnotic sounds of Brad, Versus, and Codeine, borrowed atmospheres were given new life. What do these two acts have in common? Nothing. And everything. Continents apart, they decided that what was cool wasn’t good enough and there was no shame in re-imagining the bygone music they loved. Rather than join the queues of punks, grunge rockers, nu metalers and pop tards, they proved that what was old can be so new that it’s cutting edge. And they didn’t have to be shamelessly derivative or sell their souls to do it. Throughout the 90’s, electronic music exploded. Most of the new trends were born in Britain, but soon the whole world danced (and pop stars pranced) to computer-generated music. The worst of it was canned techno, which reigns supreme to this day. 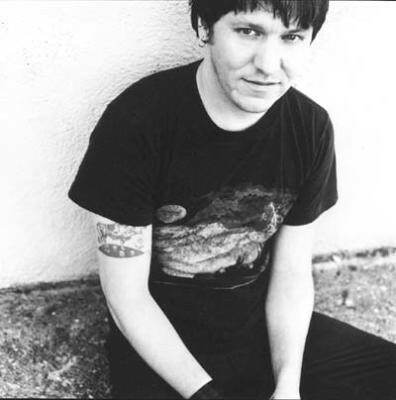 The best of it was a careful marriage of melodic analog songwriting and electronic instruments. This is the world of “trip hop”, or, as I prefer it, “Chill”. Born in the 1990’s and continuing today, Chill is a wonderful mix of psychedelia, electronica and plain old crafty songwriting. Sucked in by Massive Attack and Portishead, the Internet offered me infinite paths to more of what I desired. But my journey was surely guided by Portishead. 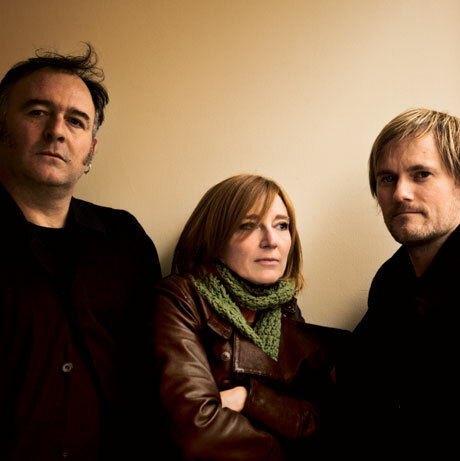 Singer Beth Gibbons and musicians Geoff Barrow and Adrian Utley created a new world of deft, understated atmospheres. At times, the music hearkened all the way back to pre-war European cabaret, while at other times it tipped its hat to 1960’s Brit Pop. Then again, it could be eerie and dark just for the sake of it. Living in America, I found myself behind the curve with Chill Beats. I hadn’t discovered Hooverphonic until 2002. Shocking! Via the wonderful resource of somafm, I dove into this new genre of music that had everything I desired: hypnotic sounds, thoughtful lyrics and sophisticated songwriting. But more importantly, I discovered an amazing fact: this is the perfect music for MAKIN’ LOVE! It all happened by accident. I had a lady friend over for dinner. We had some wine, then fell into bed. I left somafm playing on my PC and as the night went on, we found moment after special moment playing out to a soundtrack that matched our intimacy perfectly. This was the holy grail of music! You can dance to techno, you can drink to rockabilly and you can drive to death metal. But when you want to make sweet love to that special somebody, Chill is the only way to go. I challenge you, dear reader, to set your browser to somafm and click on Lush or Groove Salad. Then lure your honey to bed and let Lamb, Zero7, Ivy, Flunk and a snowstorm of other Chilly acts narrate your way to ecstasy. If this stuff fails to set the mood, I’ll send you $5. What I can’t send you is a BEATING HEART. This very long post was meant to describe my personal tastes in music. Most of all, I wanted to discuss the common thread: psychedelia. The word has been bruised by jam bands and stale 60’s numbers, but through it all, the dreamy, unearthly quality of psychedelia that I’ve found in everything from Pink Floyd to Hooverphonic has a deep connection to two things: our Universe and ourselves. Hypnotic music is present in tribal drums, Indian sitars, Scottish bagpipes, Beethoven’s rounds and Hendrix’s arpeggios. When we play or listen to mesmerizing music, we transcend the banal and enter a higher place. We experience the same chilling wonder astronomers feel when marveling at distant nebulae. We imagine mountains of color and beauty. It produces an aesthetic stirring in our hearts that we just don’t get from “rocking out” or banging our heads. It’s simultaneously earthly and other-worldly. It echoes the past and describes our deepest emotional attachments. That’s the music I like.